The market for network-attached storage has grown considerably in recent years, but in order to keep ahead of the game in this space, vendors are required to make each new box fresh and exciting with added features that help one NAS stand out from another. Built-in UPS is, primarily, what's new to the N5810Pro. Making its way to retail carrying a £649 price tag, Thecus's five-bay unit promises "unmatched security" by incorporating a small UPS that, in the event of a power outage, pledges to write unwritten data to the hard disks and safely shut down. That's always good to know, and from a hardware point of view the N5810Pro seems to tick a lot of the right boxes. 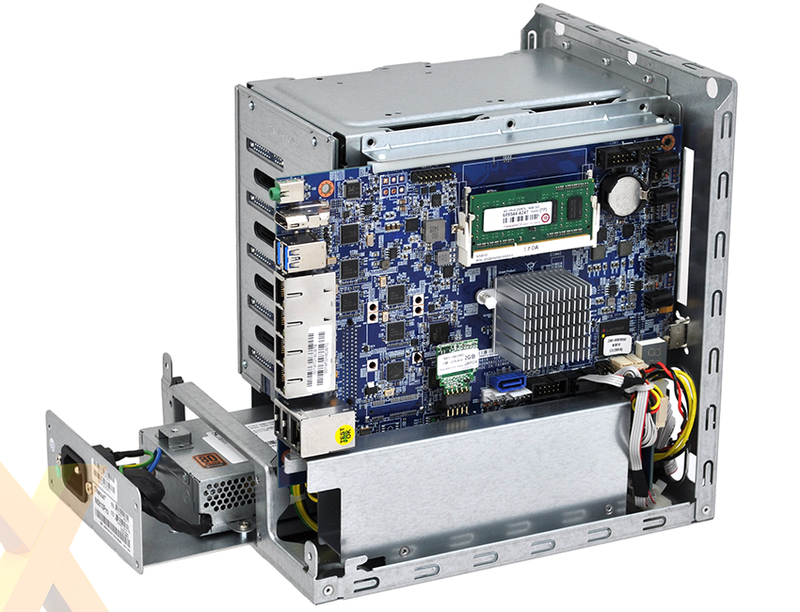 The 230mm x 190mm x 240mm chassis isn't too intrusive for a five-bay solution, build quality is decent and, to our pleasant surprise, the whole unit runs reasonably quiet. Perusing the chassis' exterior reveals a well-stocked array of functional additions and I/O ports. 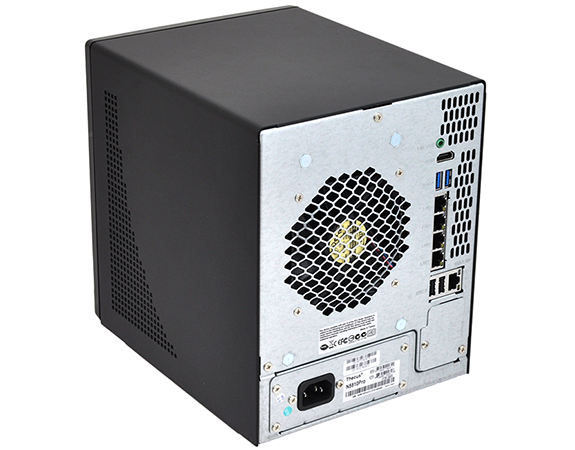 On the front of the box, Thecus includes a two-line display for easily checking system status, a column of activity LEDs, a front-facing USB 3.0 port, as well as the five pull-out drive trays, each of which is lockable and accompanied by further status LEDs. 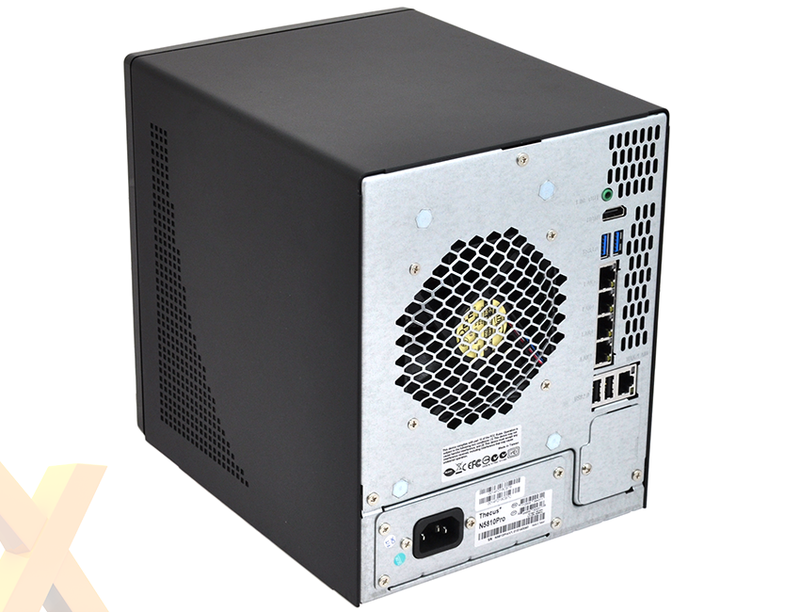 Around back, we can see a single removable fan above the integrated 130W power supply, and toward the bottom-right corner a small cover concealing the bay for the slot-in 2,000mAh mini UPS battery. Above said bay are four USB ports (two 2.0, two 3.0), a massive five Gigabit Ethernet jacks with support for link aggregation and failover, as well as HDMI and audio out. 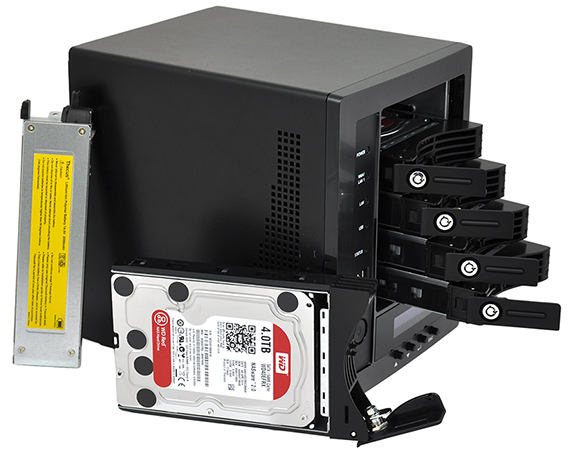 Each drive bay slides out easily and supports your choice of 2.5in or 3.5in disk, though Thecus hasn't made use of a tool-free installation mechanism. Whichever drive you choose you're required to fix it in place using the supplied screws. Under the hood, there's nothing particularly exotic as Thecus sticks with what it knows best with the tried-and-trusted combination of an Intel Celeron processor and 4GB of DDR3 memory. The passively cooled 10W CPU is a quad-core Celeron J1900 capable of speeds of up to 2.4GHz, and the default memory is served as a single DIMM, allowing for an easy upgrade to 8GB should you need it. Thecus's hardware is tidy and the built-in UPS performs exactly as expected. We yanked the power cord during testing and the NAS continued to run on battery power, with the front display and audible beeps reporting an AC power loss. 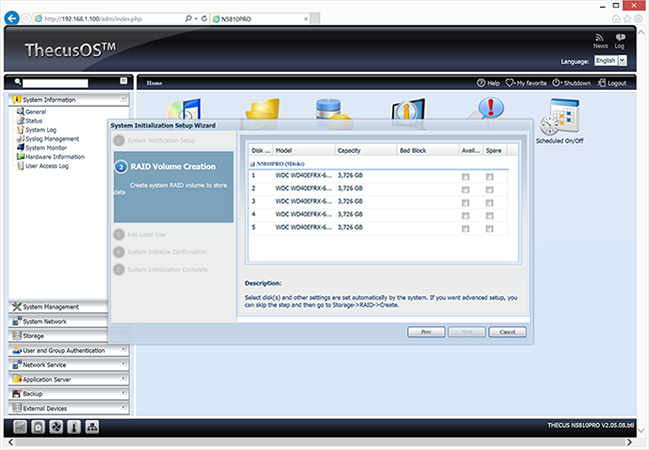 Shortly after, the NAS begins the power-down cycle and shuts down safely. 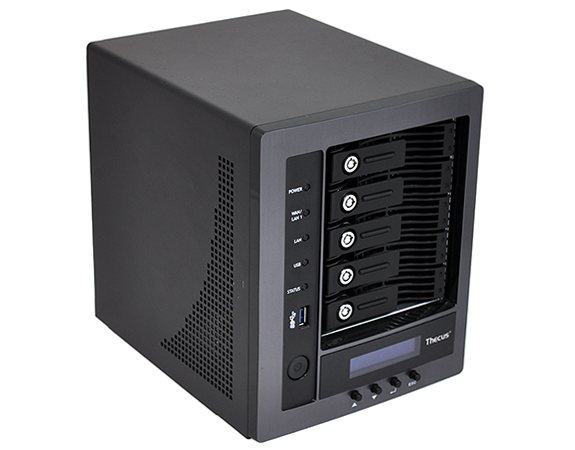 You could, of course, use an external UPS with an alternative NAS, but having the functionality built into the box removes an extra layer of clutter and in practise works well. The weak link, as we see it, is ThecusOS. The software, running at version 5 on the N5810Pro (ThecusOS 6 appears to be limited to consumer and SOHO NAS products), is looking increasingly dated and is unable to match the fit-and-finish, or indeed the feature set, that's available via similarly priced rivals. It's almost like buying a shiny new laptop, only to find it's running Windows Vista. Thecus's user interface feels tired compared to what's on offer from the likes of Synology and Qnap, and more recently WD, yet while there's very little jazz, ThecusOS is serviceable and willingly covers most of the basics. We're told that ThecusOS 7 - described as a "huge upgrade" by the manufacturer - is due in Q4 2015, but given the fact that a major software overhaul is long overdue, it's no surprise to find that Thecus has been turning its attention to Windows Storage Server.